Dezeen promotion: Samsung has launched a minimalist monitor that has no untidy wires and can fit flat against the wall to increase desk space. With a sleek, minimal design, the Space Monitor promises to boost productivity by freeing up deskspace, allowing users to focus on what's on the screen rather than what's around it. "Space Monitor is designed and crafted like a beautiful piece of furniture thanks to careful selection of materials and great attention to detail," said Samsung. "It is optimised to meet and exceed the needs of those who want a stylish, modern, and tidy environment. Instead of the standard stand that sits in the middle of a desk, the Space Monitor features a slim, built-in stand that clamps onto the back of the user's desk. The height-adjustable clamp-style stand includes a robust and durable hinge designed to withstand over 5,000 movements. This allows the user to swiftly raise or lower the monitor to their desired viewing height, including positioning it onto the desk surface like a laptop, or back against the wall. They can also tilt the monitor to their preferred angle. This not only makes viewing more comfortable, but also eliminates the untidiness and hassle of cable management, as power and HDMI cords are integrated into the arm. When the computer is not in use, it can be pushed back to sit flat against the wall, helping you to "reclaim your desktop" by clearing up the space that would typically be occupied by a regular computer stand. The clamp-style stand disappears into a groove in the back of the monitor's slim bezel – the outside frame of a computer or monitor – to sit flat against the wall. "Samsung Space Monitor is a new form of design in the monitor market," said the company. "This new monitor's unique design enhances work efficiency by rediscovering and utilising misused space of a desk for consumers." The Space Monitor is available in a 27-inch model with Wide Quad High Definition (WQHD) resolution for optimum detail, or a 32-inch model with content displayed in Ultra High Definition (UHD, 4K). 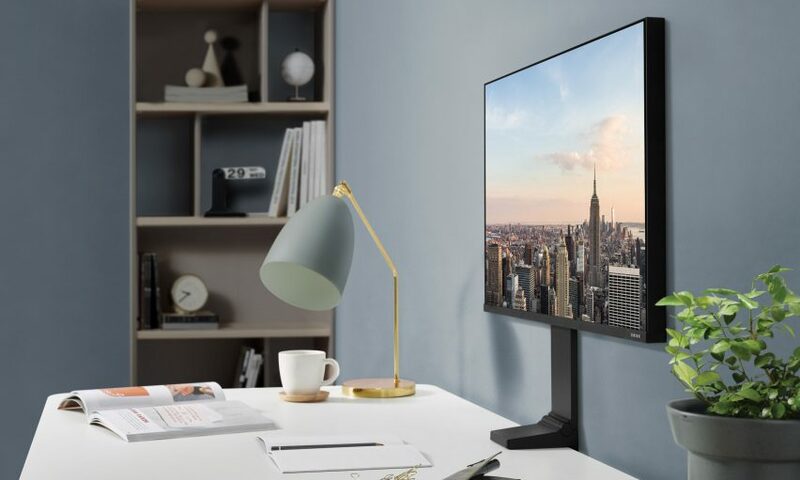 Samsung showcased the new monitor at this year's Consumer Electronics Show (CES) in Las Vegas, which took place from 8 to 11 January 2019.